The village of Rute, on the southern fringe of the Sierra Subbeticas Nature Reserve in Cordoba, is a place of pilgrimage for anyone interested in Andalucian gastronomy. The town is well known for its sweet pastries, its nougat candy, its sausages and hams, and particularly for its anis liqueur. Sweet or dry, this aniseed-flavoured spirit is something of a national drink in Spain, consumed especially around Christmas, to accompany Yuletide sweets, and Rute as been a major producer since the mid-17th century. Formerly, it was made with orujo, or marc, distilled from the mash of grape skins left over from wine making. When the phylloxera (vine root louse) plague that swept through Europe in the 19th century wiped out the local vineyards, the distillers switched to rectified cane spirits. For the classic Rute anise, this is distilled with aniseed in a still fuelled by olive wood. More recent variations include fruit liqueurs flavoured with apples, pears, cherries or herbs which are left to macerate with the spirits in large clay jars. It wasn’t long before someone thought of opening a museum to honour the town’s famous tipple. 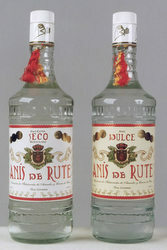 The Duende distillery, founded in 1908 and one of eight distilleries currently existing in town, opened its Museo del Anis in 1995, with displays to show the hundred-odd firms that have been devoted to making anise in Rute over the centuries. Visitors learn about the process, at the heart of which is a copper still of classic design, and get to sample the local firewater in its various guises. After a stop at the Museo del Anis, visitors can move on to the recently-opened Museum of Ham nearby. There they are greeted by a plaque with the words of the writer Miguel Cervantes, who in one of his stories prescribes the hams of Rute as an excellent cure-all. The museum is run by the brothers Jimenez and, aside from displaying the craft of ham curing and sausage making, it is a tribute to their father, Pablo Jimenez. Though now retired after 60 years as a butcher and sausage maker, he is usually on hand to recount how he would travel miles on foot to purchase the finest porkers for his shop.